Established in 1974 as a pioneer in neonatal intensive care, The Children's Hospital at Northwest Texas Healthcare System has the Panhandle's largest Level III neonatal intensive care unit (NICU) designated by the Texas Department of State Health Services. Ask the Doctor: Should I See a Doctor About My Wound? Medical Director of Northwest Wound Care and Hyperbaric Oxygen Therapy Amanda Hartman, MD, says, if you have a wound that hasn’t healed in four weeks or is exhibiting concerning symptoms like redness or painful swelling, those are signs to seek help. 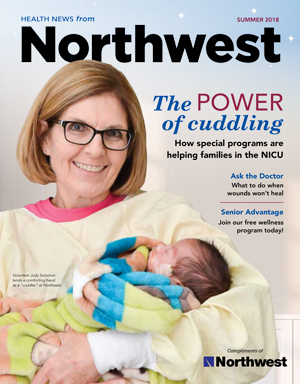 Read about Northwest's Physician of the Year, how our weight-loss surgery program has been recognized and how The Pavilion at Northwest provides behavioral health support for our heroes.